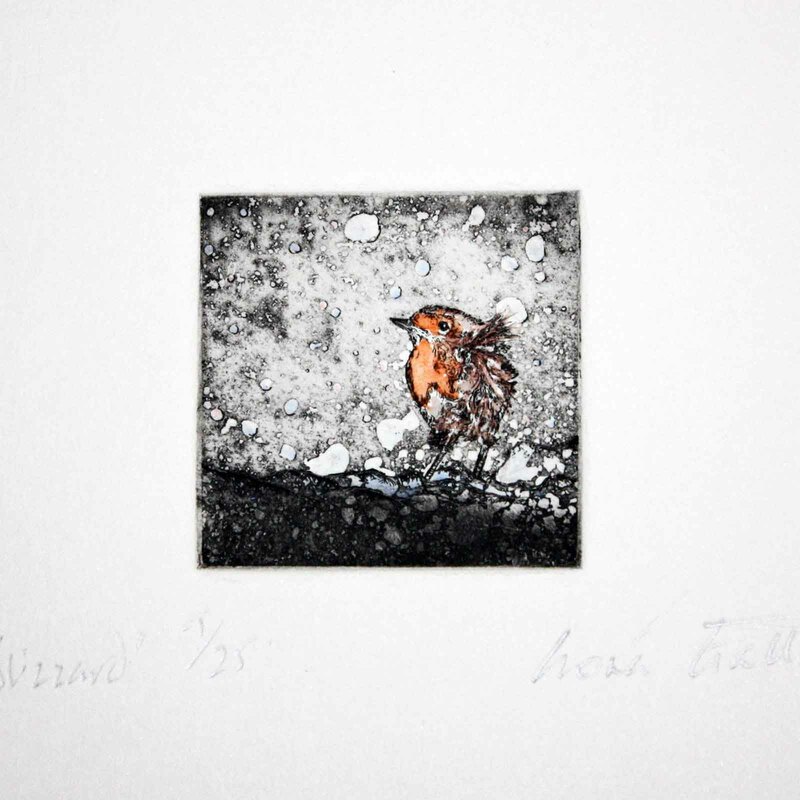 Blizzard’ is an etching on copper using a 5 x 5 cm plate pressed onto A4 ivory Fabriano paper and hand tinted after printing. The processes used in studio include aquatint, masking with stopout and hard ground. Peppy, the hand reared starling’ was inspired by a chick who had fallen out of a nest in stables and was reared and cared for at home where he groomed us and sat on out shoulders. This image was etched into hard ground and then dry point used on a 5 x 5cm copperplate pressed onto Ivory Fabriano A4 paper. Jenny Wren’ was created after observing the wren in the garden during the winter months when it would come quite close and stop to look in. The piece was created by etching into hard ground on copper, then after pressing the print was carefully tinted using a tea infusion. Cróna Gallagher is an artist based in the North West of Ireland. 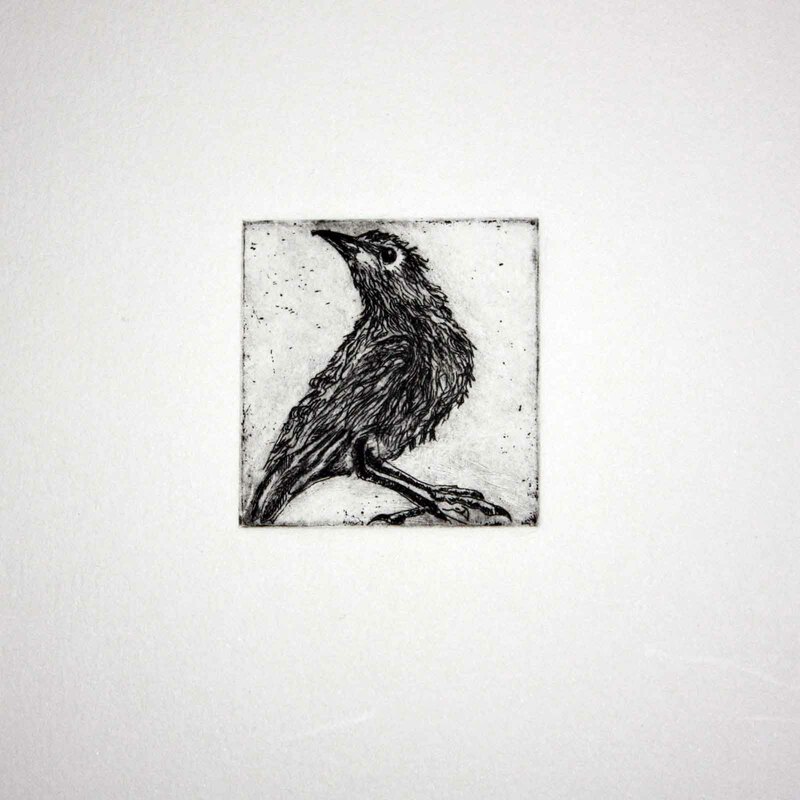 She is a studio holder at the Leitrim Sculpture Centre and practices intaglio printmaking alongside the written word. Her etchings been exhibited both nationally and internationally. 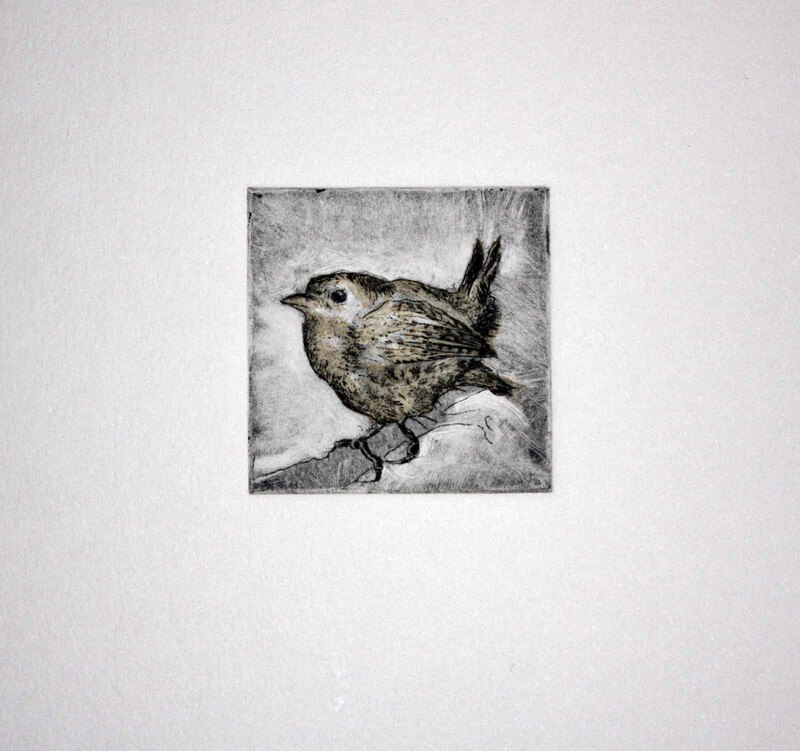 From February to May of 2014 Cróna served as Artist in Residence at The Leitrim Sculpture Centre, where she worked on a series of intaglio etchings to complement a current volume of poetry. This culminated in a solo exhibition of traditional print alongside poetry at the LSC Gallery in Manorhamilton, Co. Leitirm. She has completed artistic residencies at Tyrone Guthrie Centre and Ginestrelle, Assisi in Perugia Italy. She has also been awarded further residencies at Cill Railaig in Co. Kerry and at the Henriech Böll cottage on Achill Island, which also awarded her a bursary. The Arts Council of Ireland awarded Crόna both a Literary Bursary in 2012 and a Travel and Training award.